Judy Ann Santos and husband Ryan Agoncillo immerse themselves in the culture of Istanbul. They take a photo with the interiors of the Blue Mosque as their backdrop. 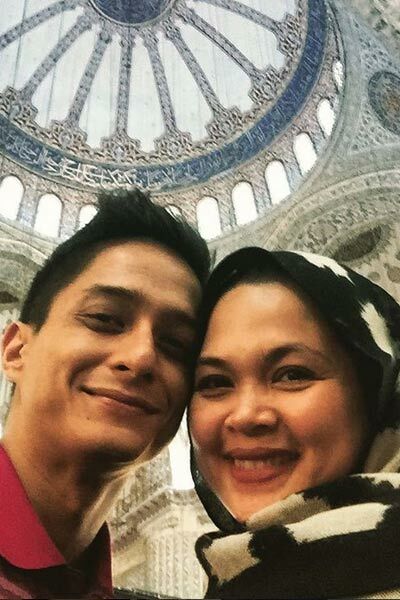 Ryan Agoncillo and Judy Ann Santos-Agoncillo have spared themselves from the erratic rain showers and chaotic traffic situations of Manila and immersed themselves in the culture of Istanbul, Turkey. It is rich in Roman architecture as Istanbul was once known as Constantinople, a powerful capital in the Roman Empire. With its landmarks reminiscent of the grandeurs of world history, Juday and Ryan are making sure to make the most out of it. SIGHTSEEING. Who can resist not taking a photo of the landmarks of Istanbul? It seems Ryan is trying to blend it as Juday takes an exterior shot of the historic Sultan Ahmed Mosque or the Blue Mosque. The couple takes a selfie under the Blue Mosque’s famous interiors. With Istanbul straddling Europe to Asia, Juday and Ryan place themselves in the middle as they ride the ferry along Bosphorus Strait. TASTE OF TWO CONTINENTS. Knowing Juday’s love affair with food, she also grabs the opportunity of learning how to make kebab from the experts. …and drink afternoon tea the Istanbul way with a baklava, a sweet Turkish pastry. Of course, Chef Juday find time to check the public market and smell the fresh Turkey cuisine around her.